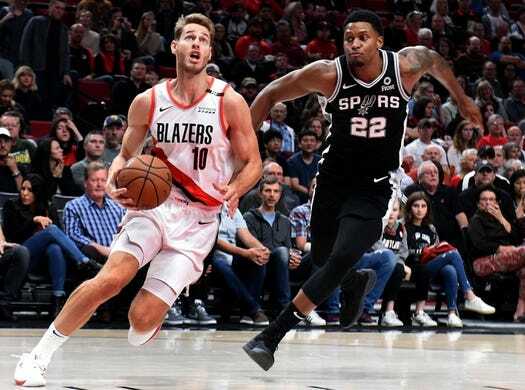 Discussion in 'Portland Trail Blazers' started by Chris Craig, Feb 6, 2019. Rules: Post a caption for the given picture before tip off. Only the first posted caption is counted. Additional captions may be posted for fun. Each poster will receive 6 points for their caption and 4 more if they win, for a total of 10 points. If you do not like at least 1 caption, your caption will not count. The poster with the most points at the end of the season wins. There will be a prize this season. Have at it. If for some reason your numbers don't look right in the standings let me know or if you have any issue with the contest feel free to pm me. "I've already dunked on you 3x this game.....here comes #4!" stampedehero, trailblazer18 and Chris Craig like this. "They tell me to keep my eyes on the hoop, so I do!" swish3, Hoopguru and Chris Craig like this. RG: I can fly like a hawk, like a hawk. The turtle is preparing for liftoff. trailblazer18 and Chris Craig like this. Radio Announcer: The bird attacks have subsided for the time being. Nurkic seems to be the center, though there are reports of minor attacks on Layman and a few on Lillard. Most of the team have managed to get out, but there are still some isolated players on the floor. No decision has been arrived at yet as to what the next step will be but there's been some discussion as to whether the military should go in. It appears that the bird attacks come in waves with long intervals between. The reason for this does not seem clear as yet. Layman: "Anything you can do, I can do better than you! Any jump, you can jump, I can jump higher! rotary111, BoomChakaLaka and TorturedBlazerFan like this. Check out how flat his right foot is planted, and the rubber bands up his leg to the scar on his right knee. This guy's no turtle, "white flight man"! BoomChakaLaka and TorturedBlazerFan like this. Layman drives with his eyes fixed on a waiting AD for the monster dunk! riverman and TorturedBlazerFan like this. Jake: Let’s see, which is catchiest, “Air Layman” or “Thunder Jake”? Jake: Rudy thinks he's gonna jump up and block the old Jake. He has no clue about the new and approved Jake 2.0! Yeah, it worked for Thunder Dan because the Sonics were still in Seattle. Frickin’ OKC ruined a great nickname. TorturedBlazerFan and riverman like this. There is the rim, and I'm looking this ball through for the score leaving you steps behind! Swish! Jake Layman! Mad dog skills. Dribble, shoot, rebounds and attracts cougar women. riverman and rotary111 like this.